From 1910 to 2010, Arizona’s human population grew from 204,354 to 6,392,017. As towns, roads, and farms expanded, human impacts on natural land cover has grown increasingly destructive. To help measure our impact, the U. S. Geological survey (USGS) with support from other government agencies created the GAP program to answer the question, “How well are we protecting common plants and animals?”, As the first step, USGS put an enormous amount of effort into mapping the nation’s land cover using a combination of satellite images and on-the-ground surveys. The result is a detailed record of the current natural vegetation and human land use of the United States. The Alaska and Continental U.S. portion of the USGS map contains 680 natural Ecological systems and 28 human types of land use. The Hawaii data contains 28 Ecological systems and nine human land use types. The maps use a 30-meter pixel cell and in most areas a minimum mapping unit of 0.4 ha (1 acre). 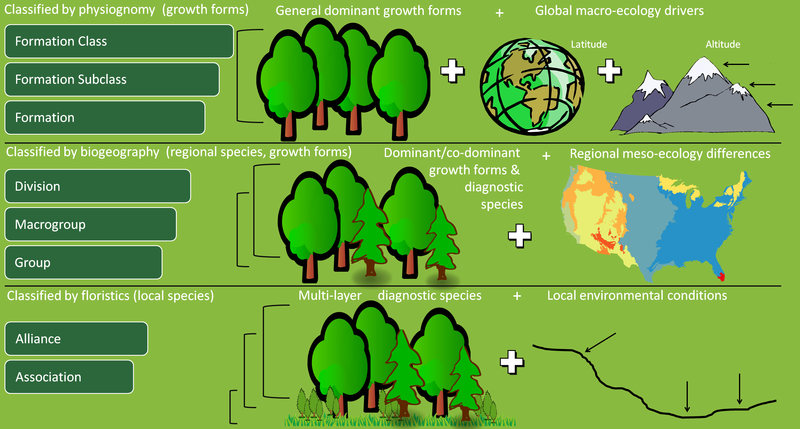 Ecological systems are defined by the vegetation. Wild animals, soils, and geology are intimately related with the vegetation. Vegetation is made up of many plant species varying in size, shape, color, and abundance. Often, one or a few prominent species give character to the vegetation. We use these species as labels in discussions of regional vegetation such as ponderosa pine-Gambel oak forest, cottonwood-willow riparian vegetation, and saguaro cactus-paloverde shrubland, Prominent species and many others are often tolerant of a broad range of climates and soils and occur over large regions. Some species are less common and are found only in certain topographic positions such as warm south-facing slopes or in the presence or absence of certain other species. Species that are restricted to specific groups are useful for classification. These “faithful or constant species” are often combined with prominent species to name and classify Alliances and Associations, the smallest vegetation classification units. Two centuries of vegetation ecology research has produced several approaches to vegetation classification. American ecologists used the previous work and their experience with North American vegetation to create the hierarchical, eight category U. S. National Vegetation Classification (USNVC). The left column of the diagram below lists the eight categories. The USGS GAP program’s Ecological systems are very similar to the USNVC’s Groups. They are easily identified and are ideal for roadside biology. Smaller units of the USNVC, Alliances and Associations, may be critical for wildlife conservation, but they are often not visible from the road. I included them in the USNVC details for each highway segment, but the time required to locate and identify them is beyond the scope of the Arizona Roadside Biology project. The complete vegetation classification for each highway segment is listed below. I used bold fonts and colors to help distinguish the classification units, and I skipped parts of the classification that do not occur in Arizona. Association names link to descriptions on the USNVC website. Four colors distinguish the Macrogroups, Groups, Alliances, and Associations. The first two Groups fit within the M088 Macrogroup. They include eight Alliances and twenty-three Associations. Sonora-Mojave Creosotebush-White Bursage Desert Scrub. This second group occurs on valley floors.